Shielding systems are designed to exceed ? x 10~5 kw primary energy dissipation rate. U.S.S. Constitution, NX 1700, was tested from 2239 - 2245. Enterprise then joined the fleet in 2245. Soon Constellation, Lexington and Potemkin joined the fleet and the Constitution class revolution began. Luminaries such as Captain Robert April paved the way. During the 2260s, about a dozen Constitution class starships were selected for 5-year deep space missions. These had been uprated to Bon Homme Richard subclass specifications. The captains of these ships would become legends: Garth of Izar, James T. Kirk, Matthew Decker, Robert Wesley and Emma Roberts to name but a few. Construction of the Constitution class continued right through this period. This was important as many of the Constitution class did not survive to the end of their five year missions. Constellation, Intrepid, Defiant, Eagle and Excalibur were amongst those lost. Barely a handful of Constitution class returned to Earth. Construction continued with the Achernar subclass in the 2260s, which included the ill-fated Defiant NCC-1764, and the last entry to the 2260s, the Constitution II subclass with early linear warp drive technology. Upon the return of the Enterprise in 2270, the first of the class home, the logs were examined from the ship and from the logs of all the Constitution class to-date. There were shortfalls in the existing configuration of the Constitution class. The answer was eighteen months of redesign and refit work on 1701 Enterprise, which had sat in mothballs for over a year, whilst other Constitution class ships had been turned around and sent back out on new five-year missions in the meantime. Hood, Lexington and Potemkin were amongst those sent back out, upgraded during their heavy repairs following the disasterous M-5 computer exercise. The new Constitution II subclass from the late 2260s was a short-term upgrade to a half dozen Constitution class. This second-rate ship was a temporary measure. A further upgrade to the Achernar subclass, the final version with circumferential warp drive technology, was an upgrade called the Endeavour subclass or Third-rate ship of the line. New concepts worked on by Commanders Scott and Spock, whilst on the deep space mission, helped to design the Constitution class ready for another half century of service. In the 2260s, starships like the Enterprise were essentially the same vessel that had been operating in the late 2240s and 2250s, with minor improvements (Bon Homme Richard subclass). With linear warp drive technology being tested on the Decatur NX-2500, the plan was for a refit in the late 2260s ready for a full application of the New Technology: Enterprise subclass. The first ships chason for Constitution II subclass with LN-60 warp engines were: Constitution, Enterprise and the damaged Potemkin, Hood and Lexington from the disasterous M-5 computer trials. Hood and Potemkin soon joined the Enterprise subclass First-rate refit ships along with Lexington after Enterprise proved her worth convincingly in 2273. New build Constitution class were delivered from this point including the Challenger NCC-2032 and Trojan NCC 4200. Later replacements were ordered for those vessels lost during their five year missions [some subsequently replaced by Constellation and Excelsior class vessels]. The Endeavour subclass vessels were upgraded in the 2280s up to Enterprise subclass standards, further increasing numbers of the uprated heavy cruiser class. 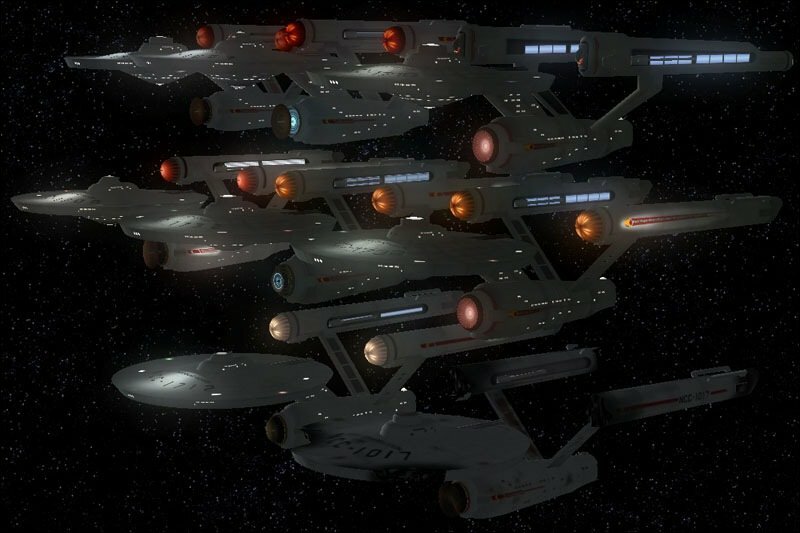 Once all the Constitution II and Endeavour subclasses were uprated to match Enterprise, the class was referred to generally as Constitution class (refit). By the mid-2290s, more Constitution class had entered service in the latest configuration pioneered by the U.S.S. Levant, NCC 1843. With the Constellation, Excelsior, Oberth and Miranda classes delivered in larger and larger numbers, older classes such as Constitution class could now have an amended role to explore as a secondary ship, the Constellation class replacing it on longer range missions and Excelsior class now the number one explorer and first contact ship. The Constitution class still has a role within Starfleet. This famous design has been found to be very flexible and readily re-configured with the latest technology. Whilst Constellation class has the range to go further, Excelsior class has more facilities and prestige, yet the Constitution class is still a good all-round cruiser. And the design is battle-proven through some of the worst encounters Starfleet has ever had to face. Constitution class is still in production in its latest configuration, ready to boldly go with a new generation of Starfleet for the 24th Century. Constitution 1700 First vessel of the class. Enterprise 1701 Destroyed SD 8130 over Genesis Planet. Constellation 1017 Lost early season 2 TOS with Planet Killer. Valiant 1623 Lost. Greg Jein T-Negative list. Intrepid 1631 Lost SD 4307, season 2 TOS. Farragut 1647 Crew killed by cloud creature. Kirk's prior assignment. Potemkin 1657 Seen in TOS Ultimate Computer, mentioned in ST: VI. Excalibur 1664 Lost SD 4729, Season 2 TOS to M-5 computer tests. Exeter 1672 Canon number as given by Greg Jein is 1672, ST:Exeter uses her number from Franz Joseph of 1706. Eagle 1685 Mentioned ST: VI. ST: Phase 2- Enemy: Starfleet features the ship as NCC 1697, lost in Meskan space. Essex 1697 named for Midshipman Farragut's sailing frigate, CV-9 and LHD-2 and NCC 173 Daedalus class. 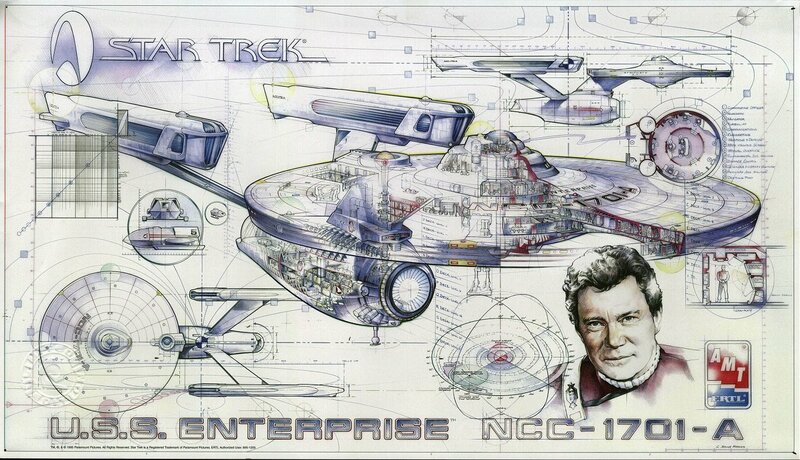 Enterprise-A 1701-A Star Trek IV - VI. Converted from new-build modified-Enterprise class Ti-Ho. Hood 1703 Seen in TOS Ultimate Computer. Argentina 1706 Original name for Exeter. Ranger 1707 Seen in Starfleet Academy. 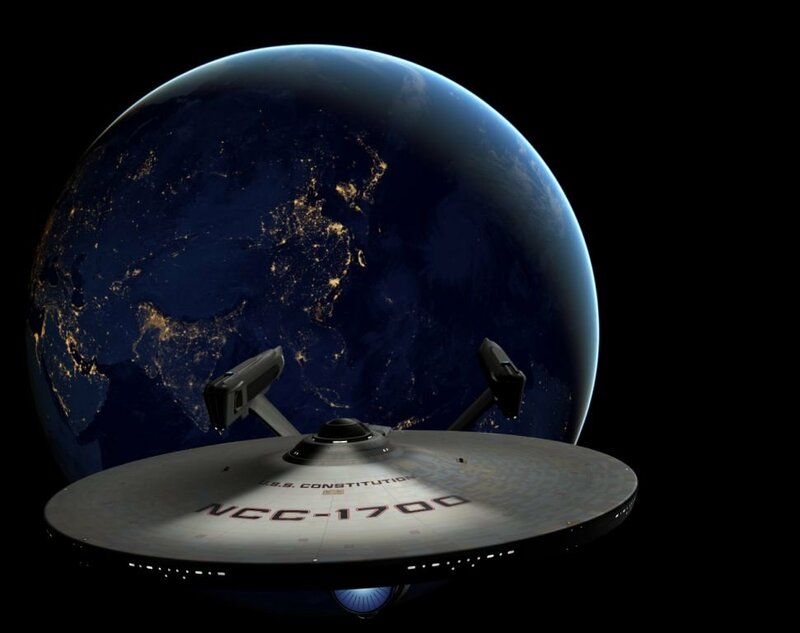 Decommissioned and replaced by Miranda class NCC 1975 by ST: New Worlds. Lexington 1709 Seen in TOS Ultimate Computer. Bonhomme Richard 1712 DC Fontana alt list. Sol 1713 Mentioned on PADD in ST: Experience and in TNG. Merrimack 1715 Mentioned in ST: TMP Epsilon 9 chatter. Excelsior 1718 DC Fontana's list. Perhaps replaced by NX 2000 before ordered. Wasp 1721 DC Fontana alt list. Ari [Lion] 1723 DC Fontana alt list. Saratoga 1724 DC Fontana's list - used on Miranda class. Apollo 1725 From Chekov's Missions. DC Fontana alt listed as Tori (Bird). Krieger [Warrior] 1726 DC Fontana alt list. Intrepid 1730 Seen in ST: IV, number by Nick Cook. Valiant 1731 Mentioned in Franz Joseph Tech Manual as replacement vessel. Defiant 1764 Lost in interphase space whilst on maiden voyage, SD 5693, season 3 TOS. Ark Royal 1791 Lance Cartwright's ship. Musashi 1804 Seen in Starfleet Academy. Agincourt 1813 Seen in Starfleet Academy. Levant 1843 Seen in Ships of the Starfleet volume 1 as Constitution III. Ticonderoga 1844 Seen in Ships of the Starfleet volume 1 as Constitution III. Raritan 1845 Seen in Ships of the Starfleet volume 1 as Constitution III. Temeraire 1846 Seen in Ships of the Starfleet volume 1 as Constitution III. America 1847 Seen in Ships of the Starfleet volume 1 as Constitution III. Scipion 1848 Seen in Ships of the Starfleet volume 1 as Constitution III. La Fayette 1866 Greg Jein T-Negative list. Hornet 1868 Greg Jein T-Negative list. Endeavour 1895 Hero vessel from Star Trek: Vanguard and Star Trek: Seekers. Mentioned ST: VI. Explorer 1966 Seen and lost in ST: New Worlds. Challenger 2032 Operation Retrieve in ST: VI. Trojan 4200 Captain Jacob McNeil in command. In a Starfleet Academy mission they simulated that he had nervous breakdown and attacked Klingon and Starfleet ships in 2283, bringing the Federation to the brink of war. In reality, the ship still serves with distinction. Monitor Unknown DC Fontana alt list. Constitution 1700 Constitution 2245 original. Prototype and early pre-production models including Constellation. Bon Homme Richard 1715 Merrimac 2250 update of the original design. Upgraded to Achernar class standards in the 2260s. Production first variant. Achernar 1766 Kestrel 2260s refit design. All refit to Endeavour subclass by 2280. Defiant was a high profile loss from this subclass. Last circumferential technology version of the Constitution class. Enhanced shielding grid. Constitution II 1697 Essex 2268 partial rebuild using New Technology. Vickers 'Achates' LN-60 warp nacelles meant the secondary hull and nacelle struts needed a re-design. A hybrid blend of old and New Technology; duotronic II computers added. Damaged vessels from the M-5 trial - Lexington, Potemkin and Hood all upgraded after their encounter. Fitted with FSTR/TAC Feet Strategic/ Tactical Data System. RIM-10C Phasers and Skat-Rar Mk 6 mod 2 Photon Torpedo system fitted. Classified as Second Rate ships of the line. Star Trek: Phase II Enterprise model. Endeavour 1895 Endeavour Refit of recent new-build circumferential warp ships. Achernar class refits after first 5-year mission ending 2272 - 2275. 'Fleetwing' LN-52 SNN warp nacelles meant that upgrade to engineering and hull was minimal, with only nacelle struts needing replacement along with the nacelles. Classified as Third Rate ships of the line. A stop-gap design to allow the older Constitution and Bon Homme Richard subclass ships to be rebuilt to Enterprise subclass standards. Less endurance than LN-design warp nacelles. All rebuilt to Enterprise subclass 2280 - 2290. Enterprise 1703 Hood Full New Technology starship 2273 - 2286. Rebuilds and new-builds. Levant 1844 Ticonderoga Upgraded Enterprise subclass. Rebuilds 2286 - 89 and new-builds 2289 - . 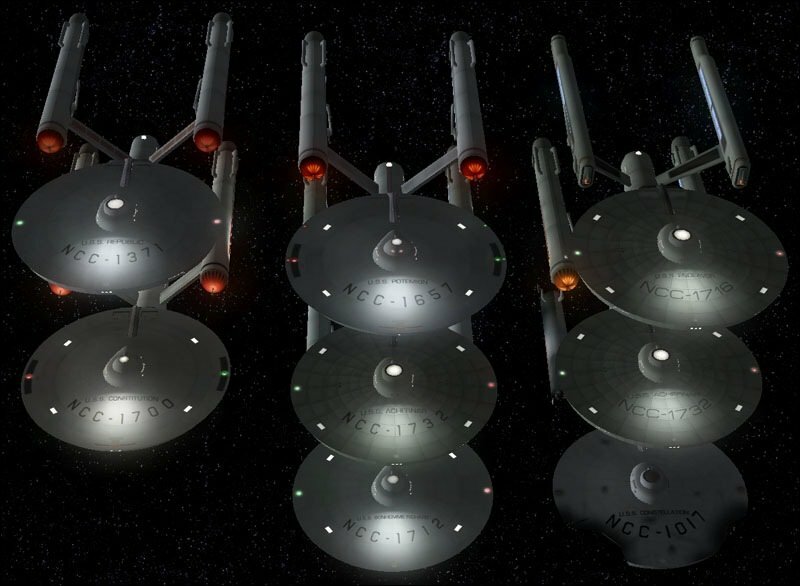 Upgraded design in light of the loss of Enterprise and Hood. Enterprise-A and Levant design. The registry numbers of the Constitution class are taken from Greg Jein's list from T-Negative magazine in 1975. In the starships from La Fayette to Krieger where registries are unknown, where possible Franz Joseph's registries have been used. Greg matched the registries to the list in Commodore Stone's office in Starbase 11, seen in TOS episode 'Court Martial'. Eagle, seen in an Okudagram in Star Trek VI, was given the registry by Mike Okuda of NCC 956. This is outwith the normal range of registries for the Constitution class and counter to registry established for it by Greg Jein in 1975. Therefore the Author has chosen to go with Greg Jein's list, which ironically was written the same year as Franz Joseph's 'Starfleet Technical Manual'. The Trek Place website is the source for these names and Greg Jein's registries. The additional Constitution class are from D.C. Fontana and Bob Justman's memos of August 8th and 9th 1967, featured in Stephen Whitfield and Gene Roddenberry's book 'The Making of Star Trek'. 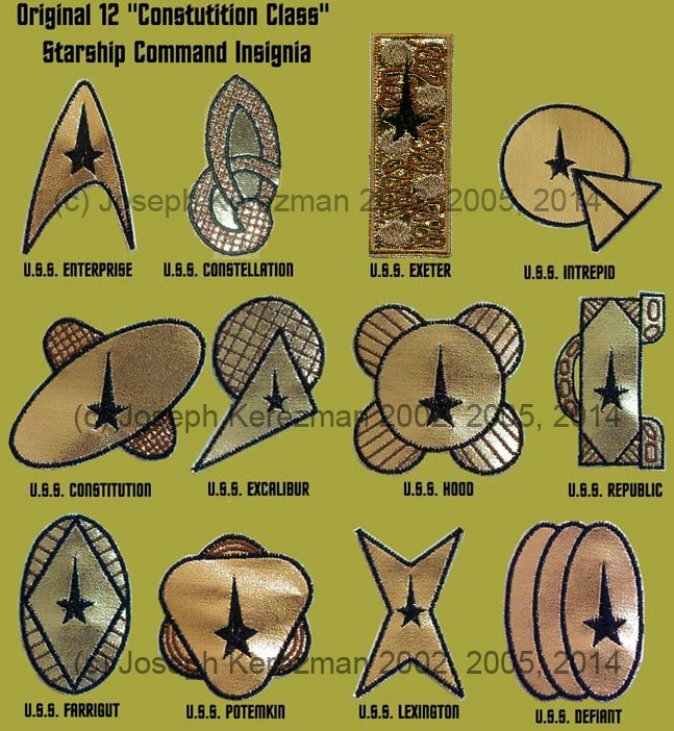 The 11 names selected by Bob Justman were: Enterprise, Essex, Excalibur, Lexington, Yorktown, Endeavour, Eagle, Constellation, Hornet, Wasp and La Fayette. [Obviously Constitution must have been the twelfth]. Greg Jein selected the following names for the twelve (as per Tomorrow is Yesterday): Constitution, Eagle, Endeavour, Enterprise, Essex, Excalibur, Exeter, Hood, Intrepid, Lexington, Potemkin and Yorktown. With the appearance of the Bozeman in TNG with the 1986 Okudagram displays on the Bridge, I have set the facts to match continuity. The 2270s refit bridge for me is the briefly-seen Star Trek IV bridge - as I have used on the Potemkin. This is the look for the Constitution class refits from the 2240s original production run. For the new-build 2280s Enterprise variant (yes, it's Enterprise variant as Enterprise was the first vessel so refit, as per 1980s fan technical manuals) I imagine a hybrid Star Trek V/VI bridge with the sleek controls of the Star Trek V bridge but with the colour displays from Undiscovered Country. Finally the newest variants have the bridge like the Sheffield, with the Enterprise B helm and Navigator stations and Tactical station at the back like on the Enterprise B.